Hull is surprisingly green from high up. The 7th floor of the University Library offers a unique vantage point to appreciate this. 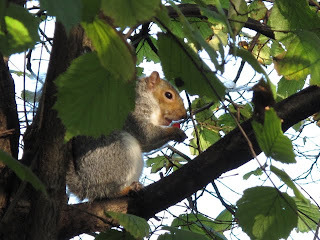 Parks, gardens, railway lines, cycle lanes, tree-lined avenues, the river Hull and drains, form a green network that allows wildlife to live right inside the city. 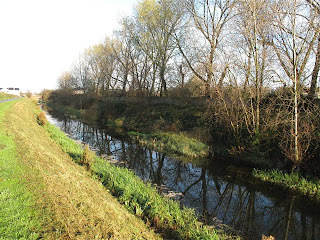 One of such green corridor is the Barmston Drain (or Barmy drain, as is also locally known). You can walk, even cycle, on the banks on part of the drain. 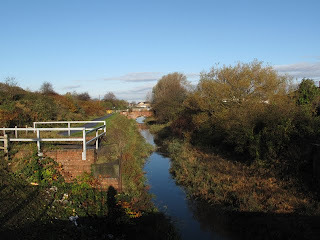 Is is crisp and sunny today and I head for the section of the drain between Stepney and Skulcoates lane via the disused railway track bed now a cycle-pedestrian path between Hull and Hornsea. 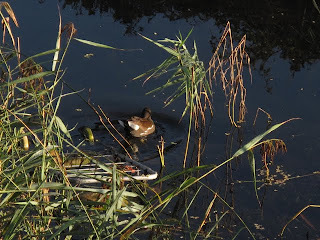 As soon as we get there we see some Mallards and Moorhens feeding. A number of moorhens are immature, so they probably breed here in good numbers. The banks are well vegetated with reeds, willows, brambles and hawthorns. One of the sections has a line of good-sized poplars on one side. A Kestrel swoops down from one of the trees into a field. The drain water runs clear, with lots of submerged macrophytes. Something jumps from the bank into the water with a plop! and disappears underwater, a Water Vole, perhaps? These are known to live on the drain. Rabbits, foxes and Roe Deer have also been reported from the drain and nearby areas. If you ignore the odd supermarket trolley or rubbish here and there it makes a remarkably nice walk. Tales from the Riverbank, is an ongoing post with great photos of wildlife in the drain led by Bob Carter. Canada geese, 28 including the hybrid and the lame one. Large flock of geese flying south in V, more than 50, high pitched call.